A few months ago, Japan received the 3DS game Guild01, essentially a compilation of four specially developed games, each created by different well-known designers. Instead of simply releasing the collection in the west, Level 5 has chosen to instead publish the individual games as eShop titles — though it seems that only three of the original quartet are coming our way. 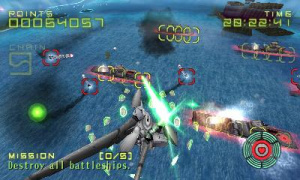 The first of the trio to be released is Liberation Maiden, perhaps the game with the highest profile out of the four, as it has been designed by Grasshopper Manufacture's Goichi Suda (better known as Suda 51), who is well known for creating many other unique titles like Killer 7 and No More Heroes. 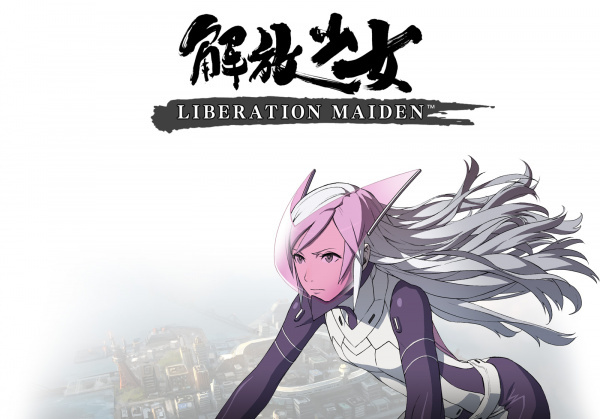 Liberation Maiden is a quite unlike the rest of Suda 51's output, because as far as plot goes, it's not nearly as wacky or outlandish as what he's offered previously. You play Shoko Ozora, newly appointed female president of an organization trying to restore natural beauty to New Japan - which has been completely ruined by invading forces from an enemy country. To do this, you'll have to fly around inside your Liberator - essentially a flying mech suit - and blast all of the enemies you encounter with your fearsome arsenal of weapons. The game is pretty much a free-roaming shoot 'em up in a three-dimensional space, with bullets, lasers and missiles flying everywhere. 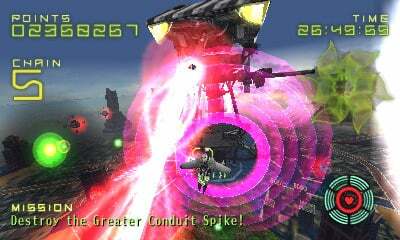 Your objective in every stage is to locate and destroy three "Lesser Spikes" - which are like large energy cores - in order to gain access to a Greater Spike, which is, just like its name implies, a much bigger core. The destruction of this will bring the mission to a successful conclusion. When you begin, your only weapon is a set of homing missiles. As you slide your stylus around on the touchscreen, a reticule will appear on the top screen which can be moved over enemies in order to mark them as a target. If you've played Rez or Panzer Dragoon then this 'lock on' system will be immediately familiar. 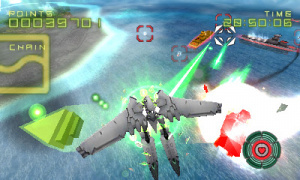 Lift the stylus from the touchscreen and you'll unleash a barrage of missiles on all enemies you've marked. However, before long you'll also gain access to a laser weapon, which is much simpler in use - you just fire a continuous damaging beam wherever you hold the reticule. The trick is to not hold the touchscreen for too long at a time - yes, you'll mark enemies or fire the laser, but the longer you hold it, the more vulnerable to enemy fire you become, so it's a good idea to periodically release it so you can react to incoming threats. 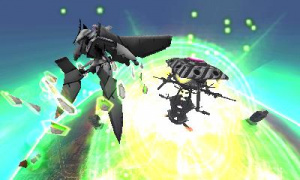 Various other mechanics come into play as well, like a "suicide" attack in order to finish bosses (which bizarrely involves repeatedly drawing circles on the touchscreen), and a counterattack when your health gets critically low, but you won't use these very often during each mission. Shoko also has the ability to strafe by holding the L button, which might cramp your hand a bit, but it can be quite useful when tackling some of the harder sections of the game. The game's graphics are commendable and despite all the amount of stuff going on, it never suffers from any slowdown. The definition is a little off, with some of the 3D models appearing quite blocky at times, but when you consider the amount of action on display, this is forgivable. There's also some nice animated cut-scenes which do a decent job of immersing you deeper into the storyline. Sonically the game is also impressive, with action-packed songs (including some with vocal backing) and some high-quality voice acting. Unsurprisingly for a Suda 51 title, Liberation Maiden is dripping with cool, but it does suffer from repetition after prolonged play. Every stage is practically the same, but with only five stages to face, you could argue that the game is over before it has chance to outstay its welcome. Even when the credits have rolled, there's still some replayability, with three different difficulty settings and a gallery in which you can unlock additional background story and other things by completing certain challenges. Despite these bonuses, it's impossible to escape the fact that Liberation Maiden is short and sweet. Liberation Maiden offers a surprisingly short experience, but if it were much longer the sense of repetition would probably become quite irksome. For all its flashy visuals and instantly gratifying action, this isn't a game that boasts a tremendous amount of variety or depth. Despite these shortcomings, Liberation Maiden remains an enjoyable eShop title with some interesting gameplay mechanics which pay tribute to classic blasters like Sega's Rez. It's just a shame that there's not more to it, but while it lasts, it's good, wholesome fun. Too bad there's no survival mode or something. any word if the US is getting this? really? thats great! thanks Damo! It is sure one to consider, next to NightSky, Denpa Men, Fluidity, and the other 2 Guild games. I felt the way about the entire title. All four games feel a little hollow, but they're fun in the very short term. Alright, I caved in and bought it on impulse. A great title but the review is accurate; it's short and sweet. I love Suda and will buy this to support Japanese niche games as I always have. I bought this right after the 3DS Nintendo Direct. It has a real Neon Genesis Evangelion vibe to it. Very Japanese but still it's got good production values and it's fun to play. In the Nintendo Direct presentation Shibata said that the 3 Level-5 titles would be coming out this year, so there is still a chance that the last game could be out in January. I just noticed by clicking the 'website' button in the eshop takes you to the 3ds browser.. Is this new? Short length has never been a problem for me as long as the gameplay is superb. Vanquish was my favorite game of 2010 and everybody said that wasn't great because of its short length. Not to mention, this game gives me a huge Zone of the Enders vibe for some reason so I bet it's going to be way fun to play and replay. no thats totally normal and has been done before. i still dont know if i should get this game. i love the artstyle and music but i already know i will hate the controls at some point (never played kid icarus). Well 2 weeks is not bad then. Thanks for the release date! Doesn't sound as long as I thought it would be but as @47drift said gameplay is more important than length. Sin and Punishment: Successor of the Earth is my second favourite game that I've got so far this year and that took me 5 hours to beat. The 25th is going to hurt my wallet with this & NightSky releasing, lol! While certainly a very enjoyable game while it lasts, I did feel a bit ripped off afterwards considerings its length and price. If you've got plenty of money to spare though, it's worth getting. Wonder what the US pricing will be. That will be the deciding factor for me, unfortunately. I really would like to get this, shame about the length. Quality titles deserve my purchase, but the cost may be prohibitive in this case. Cool, it's like a handheld version of a new Rogue Squadron or Descent game! Liberation Maiden has 5 stages and three difficulty levels which you tackle over and over. Playing story mode unlocks each stage for stand alone playing. The game is about improving your score. It isn't an RPG people, it's a shooter. Take it at that. The talk about your hand cramping is utter rubbish. You can press the L button to activate/deactivate strafe so there is no need to hold it down. I don't see how the reviewer missed this. Repetition? Once again, it's a shooter. You shoot things over and over. Fair point. It is repetitive, but that's what the genre is if you want to nitpick. The core mechanic may be repetitive but the stages are actually quite diverse. Every area looks different and there are even some 'sneak' missions thrown in. In one stage I even unlocked a sub-mission during the main stage objective. I'm sure there are more to be found which means that it has depth, if you spend some time looking around and don't just gun through on the path of the objective. Overall it's a nice review but I feel it misses a few points. If repetition and longevity are the main faults here then how can this possibly score less than Sakura Samurai? Both are short and repetitive but Liberation Maiden has higher production value and diversity. The latter has perhaps a little less charm I'll admit, but easily matches the former in terms of quality and gameplay. It's great for what it is. It's far from perfect, I'll admit that, but we shouldn't judge it as something it clearly is not. I have to agree with @wuuds I downloaded hana samurai last night but so far i have enjoyed playing liberation maiden so much more. Its just such an incredibly satisfying game. I am a sucker for Anime , Mechs and J Pop though and i just checked my stats and i have already accumulated 9 hours and 16 mins of play time since its release jesus didnt realise i had played it that much. I got it! And I am quite enjoying it! Think it just about scrapes an 8 for me. I really enjoy. Very suitable as a DL. Reminds me a bit of Kid Icarus flying sections and a Rogue Squadron in 3DSware Japanime form. Sort of. Good little game. looks great, i'd download this one! Liberation Maiden is short but incredibly fun. But there is a lot of unlockable achievements to keep going back to the stand alone stages for. It is a high score arcade game and I didnt mind the price because what you do have seems to be of a really high quality and the 100% voice acting and the Manga animation are a nice bonus. You do get the feel of a retail game from this and if they add a lot more stages and possibly an online element to this they could well make a stand alone retail title rather than a single downloadable title or part of a retail compilation. hell, I wish they would just localise Guild 01.
well no review so far has mentioned that L-button is for activate/deactivate strifing. i thought you would have to hold down L all the time for strifing. You just go into 'settings' and change strafe from 'lock' to 'toggle'. That simple. You'd think someone would simply look at the settings menu if it was such a pain. Rush job I guess. Yes! This is eating away the hours for me too. It is still not for everyone but if it's for you then you'll love it! What are your scores for the stage modes so far? I'm playing through them progressively starting with Easy and moving up from there. I want to see how high i can get in each stage before moving up. Still trying to get a hang of the scoring system. I'm trying to find the best way to chain and get the multiplier up. Any insights? Getting a purity up to 'perfect' also adds to the scores nicely. Amazing review! This sounds like my type of game. I can't wait to download this baby when it comes to the eShop in late October! I have bought the game already at it is pretty good! It has a Lylat Wars theme to it, kinda. Hope it will be discounted in some months. Other eShop games that cost about the same seem to be more well-rounded. I thought it was an odd choice of controls, I was hoping for something more like Kid Icarus: Uprising in terms of controls. Is a tad bit expensive considering there are only a mere 5 levels, also repetitive, but I didn't mind the repetitiveness much because it is a fun game. @xj0462 this is most likely an error. Game is amazing! I personally give it an 8/10 despite the short length of the game. If Suda51 could add 5 more levels to the game, then I would give it a 9/10. Combats feels like recent Silpheed games, too. After downloading the game from the eShop and playing through moments ago, I have to say that Suda 51 did a fantastic job. Gameplay is a lot like a free-roaming Panzer Dragoon, but with a control scheme almost similar to Kid Icarus: Uprising and a pretty cool storyline. The voice acting is excellent and the anime cutscenes (made by BONES of Full Metal Alchemist fame) look great. While the game is very short with only five stages, there's much replayability with three difficulties, score attacking, and gallery unlockables from completing challenges. This could've been a retail game had it featured more stages and weapons. That said, Liberation Maiden is an awesome game by Level-5 and Grasshopper Manufacture! Just wanted to Clarify something in the review. you Don't have to hold the L button to strafe. Just tap the L button once to go into strafe Mode and then Tap again to get out of strafe mode. That will save your hand Cramping The Game is Excellent although short. But you will want to beat the game on each difficulty level as it has unlockables for each Level. I highly recommend this game even though it is a little low on content. Its just outstanding shootem up fun with a unique control scheme which works very well and is just about perfect for this type of game. I totally agree with Marcel's 7. It's a game worth the Time and money GREAT REVIEW MARCEL! It was my fave 3ds eshop game, but then i broke my stylus. Anyway, sorry to post three times in a row, but I noticed something that wasn't in the review! If you're fresh out of Deflecter Nodes, but your Sword Gauge is full, you can preform a counter-attack. I got this game yesterday during the sale. The game is really fun. The anime cut-scenes are wonderfully done, the voice acting is great, and the vocal songs are excellent! I'm surprised this review failed to mention that the game is for right-handed players only. There is no option to rearrange the button layout to suit left-handed players, as there is in Kid Icarus. As I am left-handed, playing the game is difficult and tiring, not to mention frustrating because I could play better if this were adapted for left-handed players. Sadly, this is yet another game that could benefit by the 3DS having two thumbpads smh. However, I think to control scheme is perfect.